Pictures of Romanesque Basilica of San Frediano Lucca. Images & Photos. Pictures of the Romanesque Basilica of San Frediano Lucca, Tuscany, Italy. By the 6th century Christianity in Italy was in turmoil. Ostrogoths and Lombards had conquered much of the north of Italy and introduced Arian Christianity in opposition to the Roman Catholic Christianity. Missionaries from the Celtic Christian Church of Ireland were sent to convert the Italians, one of which was Fridianus who became Bishop of Lucca. During his episcopate, Lucca was attacked by the Lombards and the Cathedral of Lucca was burnt down. Fridianus had a church built on the spot of the present basilica, dedicated to St. Vincent, a martyr from Zaragoza, Spain. When Fridianus was buried in this church, the church was renamed San Frediano in his honour. The Romanesque Basilica of San Frediano Lucca we see today was built from 1112 and consecrated in 1147 by Pope Eugene III. In the 13th century A huge mosaic panel was added to the facade of the church which was decorated with mosaics depicting Christ Pantocrator above the Apostles. The mosaic was made in an Eastern Roman Byzantine style by Berlinghiero Berlinghieri of Lucca. The mosaic depicts Christ sitting in a Mondorla, eye, giving his blessing. His throne is supported by an angel flying on either side. Below are the apostle standing in a row looking up at Christ. In typical Roman Byzantine style the figures are set against a gold background. The influential power of Roman Byzantine art is often overlooked due to the division between the Roman Church and Eastern Orthodox Church. Byzantine Constantinople was the envy of all Christendom in the Middle ages and its art was the benchmark for all great art of the time. Roman Byzantine mosaics are found in many important Italian Romanesque churches such as in the apse of the Duomo of Pisa, San Miniato in Florence and St John Laterine in Rome. 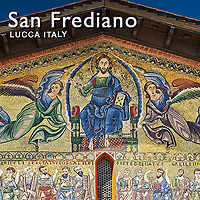 The exterior Byzantine mosaic panel of San Frediano Lucca is a more unusual Romanesque architectural feature. Later mosaic panels are found on the Cathedrals of Sienna and Orvieto and maybe these were inspired by The Romanesque Byzantine mosaic on the Basilica of San Frediano Lucca. But pictures of the Romanesque Basilica of San Frediano Lucca as stock photos or buy as photo wall art on line.